Subnet Plus for iOS Is a free Subnet Calculator for the Network Professional on the go. 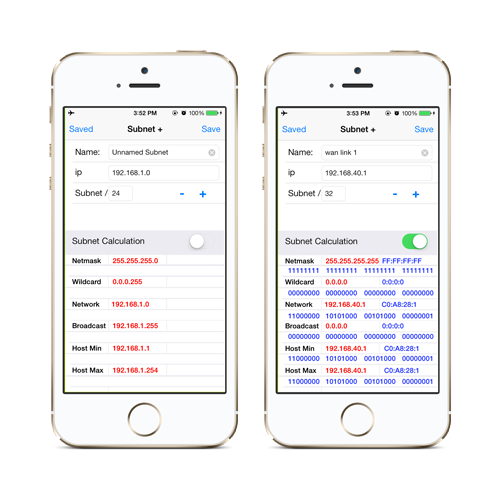 Updated for iOS 9, this IPv4 subnet calculator allows for the input of an IP address and subnet. It returns the number of hosts, subnet mask, wildcard mask,in dotted decimal format, binary and hex. For now the calculator is FREE! Give it a try. As we add functionality we will start charging for it. 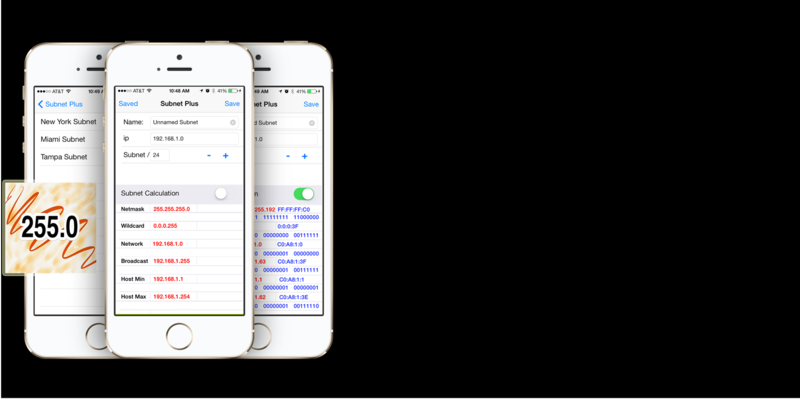 Subnet Plus iPhone application Is a free Subnet Calculator for the Network Professional on the go. A handy tool for those just learning or studying for CCNA or networking exams. Nice touch being able to save calculations! I can’t wait to see the evolution of this fantastic tool! Save your subnet calculations into the built in database for easy reference later. What is a Subnet Calculator? Why it is the tool all the cool Network Engineers use. What is a Subnet Calculator? Well for most Internet users it is of no use. So if you don’t know what a subnet is this is probably not the Calculator for you. If you have an idea of what a subnet is then maybe this is for you. So, what the Subnet Plus subnet calculator helps you do is divide a large network into smaller networks to give you more efficient use of IP addresses. For example For example a address or 192.168.10.0 /24 has a subnet mask of 255.255.255.0. That subnet gives us 254 possible host addresses. The same address 192.168.10.0 with a /31 or subnetmask of 255.255.254 gives us a network of just 2 hosts. Hopefully this will give you a general idea of how subnetting functions.